I like to feature pioneering women during National Women’s (Art) History Month. The arts are obviously no exception to the fields in which women have pioneered and excelled. This is as true in Japan as it is in Western Europe and America, where art history texts are not liberally sprinkled with the names of women artists. And, just as in the West, women artists have existed since the earliest cultures, many forging lifelong careers in the arts. In 2016, I blogged about contemporary bamboo art, and somehow overlooked Aya Kajiwara (born 1941). Since there are 400 to 500 species of bamboo in Japan, and it has been a revered art medium since ancient times, I think bamboo art worth a second look. 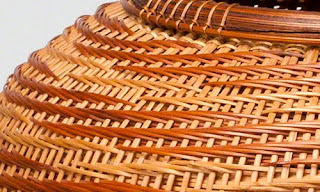 The art form of weaving and plaiting bamboo for storage baskets in Japane dates back to the Jomon Period (ca. 3000–200 BCE). Many varieties of bamboo in Japan are still used in household construction and utilitarian objects. Traditionally, bamboo baskets were made to store rice and saki, as flower holders, and harvesting tea. When the tea ceremony (chanoyu) and flower arranging (ikebana) became popular among the elite classes, the focus on proper etiquette and tools for preparation led to an expansion in the type of bamboo objects made. The tradition of bamboo weaving and plaiting continues in contemporary art. Japanese bamboo artists undergo strict apprenticeships that can last as long as ten years. Bamboo is a time-consuming medium due to its straight, coarse, and stiff qualities. Apprentices have to learn how to manipulate it before they can start developing their own individual style. Kajiwara is the first and only woman admitted as a full member to the Japan Art Crafts Association. Her interest in working with bamboo evolved when she married the renowned bamboo artist Koho Kajiwara (born 1935), at first assisting in his studio. She ultimately attended the Beppu Occupational School, the foremost art school with a bamboo curriculum. There she studied with teachers who themselves were pupils of Living National Treasure artists (those certified as Preservers of Important Intangible Cultural Properties), such as Shono Shounsai (1904–1974). Like many artists dedicated to the stringent training process in bamboo, she had to take part-time jobs while studying. She graduated from Beppu in 1980 and began winning awards soon after. Starting in 1992, Kajiwara has been admitted to the prestigious Traditional Craft Arts Exhibition many times. 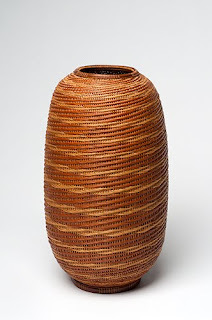 Kajiwara titles her bamboo pieces because, like most bamboo artists, the weaving of the material is not meant simply to produce utilitarian objects. Her work follows the tradition of the hanakago, the baskets made for holding flower arrangements from the special ceremonial Ikebana. In the Ikebana, these baskets are viewed as sculptures, rather than utilitarian objects. Many of her titles allude to landscape or parts of nature. Red Clouds shows the skill required to tightly weave bamboo. Madake is the most common type of bamboo in Japan. It has large-diameter stalks with a very straight grain that is easy to split into finer strands. Just take a look at the incredibly fine strands that compose this object. You’ll become a new fan of bamboo art as I did in 2016! Kajiwara Aya, Red Clouds, detail, 1998. Madake bamboo and rattan, 15 ¾" x 8" (40 x 20.3 cm). Philadelphia Museum of Art. © 2018 Aya Kajiwara.